It is Workers' holiday tomorrow, May 1 and I went on a rampage to get good stuff that will fill this weekend and next week and make you have loads of fun. Arojah Royal Theatre has put together a stage adaptation of Ben Tomoloju's piece Flowers Introspect. 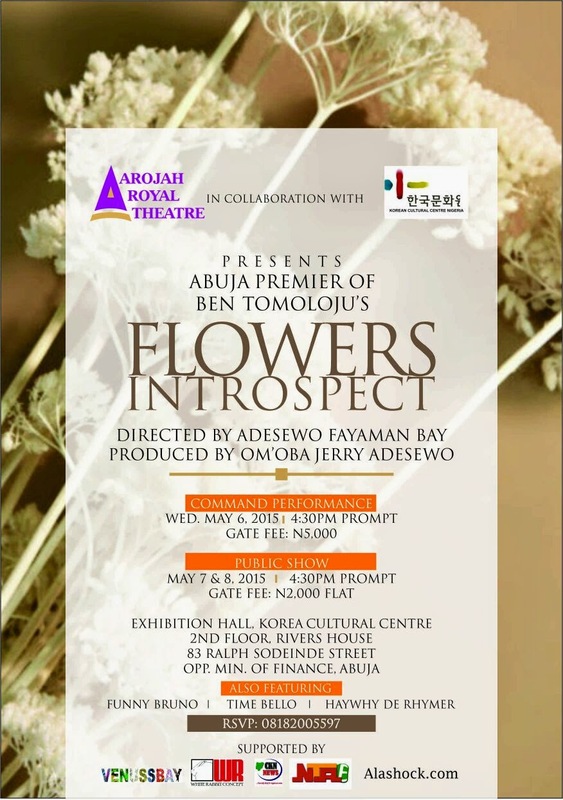 There will be a Command Performance with Tickets cost at N5, 000 on May 6th and another two performances on the May 7 and 8 with Tickets at N2, 000. Venue is Exhibition Hall, Korea Cultural Centre, 2nd floor, Rivers House off 83 Ralph Sodeinde Street opp Min. of Finance, Abuja. Keep Calm and check later for May Day events and give-aways.